Harrowing images of an ash-covered boy who survived an air strike in Syria has quickly spread across the internet, shocking and disturbing social media users. While there are many horrifying images from Syria, this, like the image of drowned Syrian refugee Aylan Kurdi, managed to capture the world’s attention. The boy was supposedly pulled from the rubble after an air strike in Aleppo’s Qaterji district, a rebel-held area, on what is thought to be Wednesday night. Video was circulated showing him being rescued from a ruined building and carried into an ambulance, where he is placed on an orange chair. The dazed boy sits quietly in the chaos, before touching his face and then wiping the blood and dirt on the chair. A second young boy is carried to the ambulance moments later, followed by a man covered in white ash. The victims were rescued by the White Helmets, or the Syrian Civil Defence, a group of volunteers who rescue people from bombed areas. The boy has been identified as five-year-old Omran Daqneesh and his condition is stable. He was treated for his head injury and released from hospital later that night. According to the Telegraph, eight others were wounded in the air strike, including four other children. Most media sources have described the attacks as coming from either the Syrian military or Russia, largely because the video was first shared by an anti-government activist group, the Aleppo Media Centre, and posted on its Youtube channel late Wednesday night. However, there is still no confirmation as to the source of the attacks. 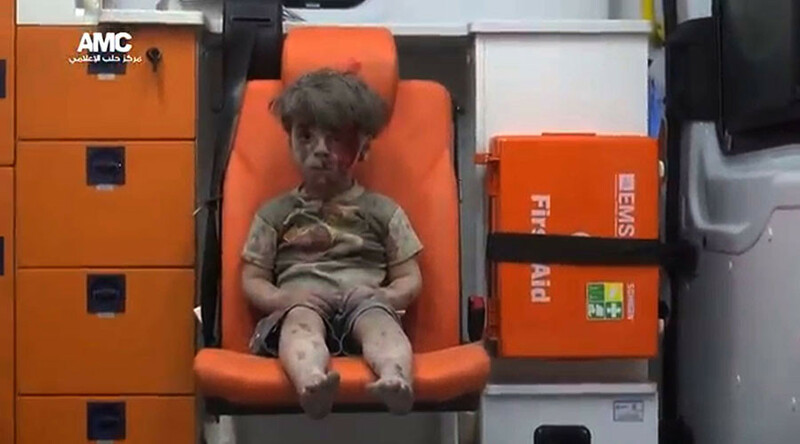 People around the world have expressed horror and frustration as they share images of Omran. Others shared additional images and video from Aleppo and Syria. @rafsanchez@rainbowrowell This is so unendingly heartbreaking, but I'm left feeling helpless. What can I/the U.S./any of us do? And some questioned why this image has gone viral and not ones of other children affected by war, including the US-backed Saudi air strikes in Yemen.